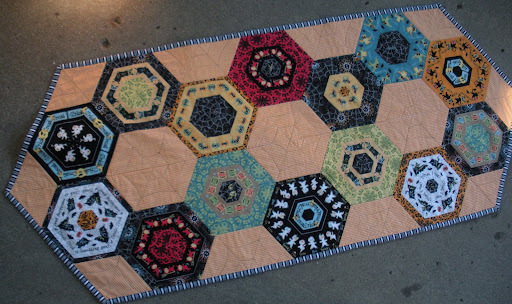 One might get the impression I’ve become a little obsessed with hexagons, but the truth is, this project was suggested to me, and done as a sample for the shop. Thus the Halloween project post on the heels of Independence Day. Instead of using 2.5″ strips, I used the striped fabric from this line for Lyndhurst Studios by Northcott. 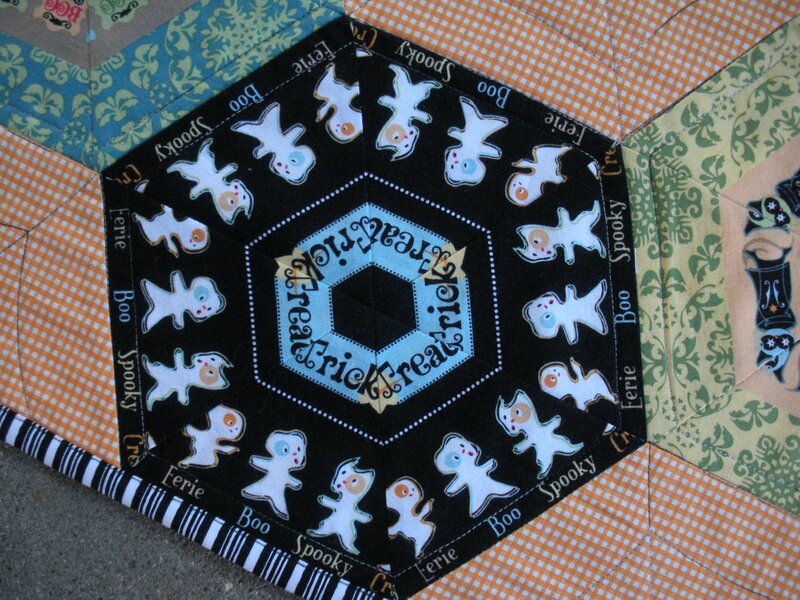 It’s called Trick or Treat Street and is by designer Sheri Beary. I adore these silly little ghosts with their names running along the edge of the stripe. The orange gingham style fabric I used for the accent blocks is actually from a civil war reproduction line…not sure what line or company it is, but it was a perfect orange for the “tangerine flavored” oranges in the striped fabric. This is what I used for the backing, from my stash purchased sometime last fall. 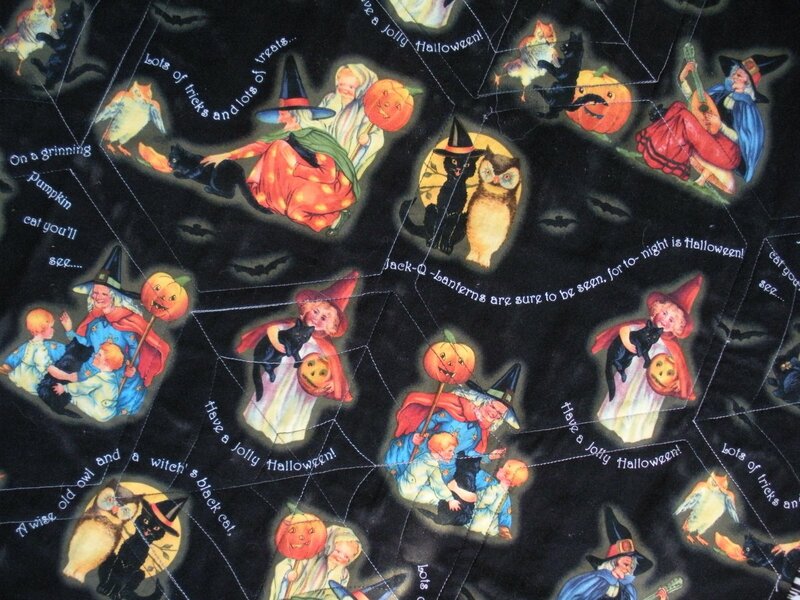 I love Halloween color combinations and imagery. 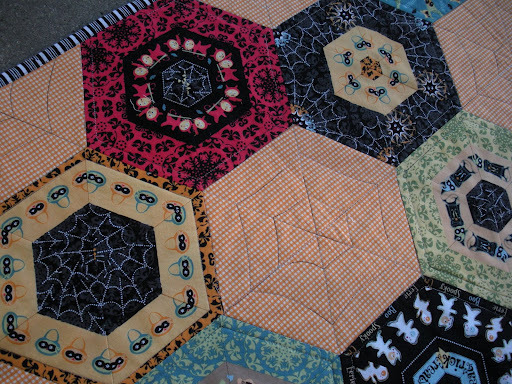 The quilting was done with a black/grey/white variegated thread…just a simple outline around the pieced hexagons, and a spider web in the orange accent blocks. I’m pretty happy with the way this one turned out. Only now, I need a larger table to display it, my table is a small drop-leaf vintage table that only extends to maybe 42″ x 42″ at it’s largest…I’m sure I can find another way to display this though! Or, maybe I need to make a smaller one and give the big one away as a gift…. What an awesome table runner — I absolutely love it! I think Halloween decorations are vastly underrated. 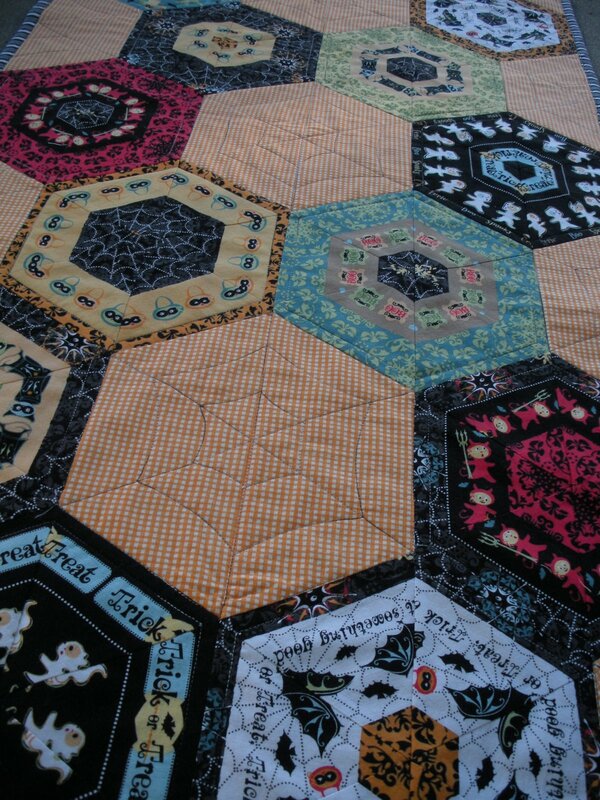 I love how the quilting looks like spider webs! That was a great idea. I really like that fabric line, too. You made great use of the stripes! Doris! it's lovely! I love how you laid out all the fabrics so perfectly for the hex's! 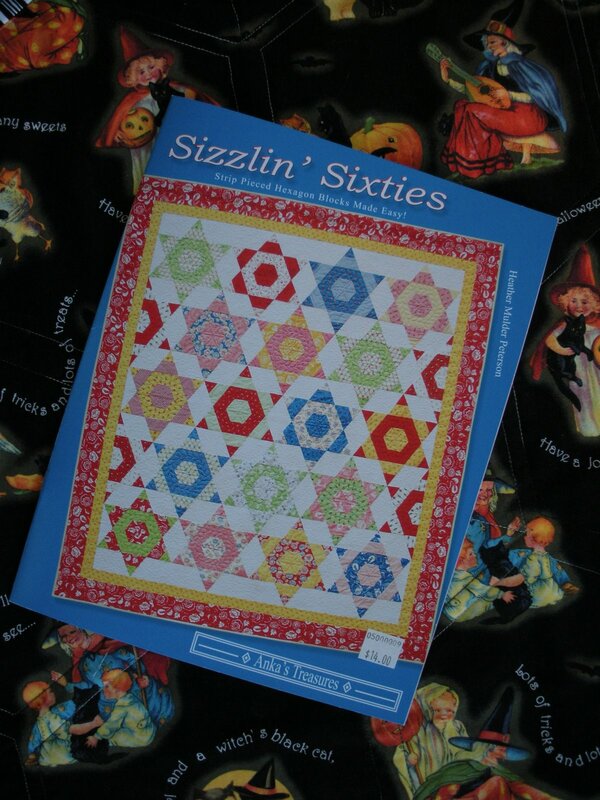 I'm going to see Heather from Anka's treasures next week! She lives on the lake where I have my cabin! small world. Pick Me Pick Me! Great job D – I really love it!! I've always had a soft spot for spiders and Halloween. This is very cute.